We are sorry, but this coupon is no longer available. Making your loving pet feel wanted and loved while you're away! Purchase 2 dogs walks and get one for free! Leo Sisters will make your loving pet feel wanted and loved while you're away! We have many services, including: Mid-day Dog walking, Overnight pet sitting care, drop-in pet sitting care, cat sitting, small mammal care, reptile sitting, bird sitting. Specialty services include: Pet taxi to your vet or groomer, Give medication, hotel care, business trip pet sitting, and we offer active duty and veteran discounts - able to care for pets on base. Competitive pricing, great care for your animals is what sets us apart. Melissa and Megan are sisters with a dream. Melissa is a entrepreneur, dog owner and mom to three children. Megan is an entrepreneur, dog owner, Army Veteran and college student. 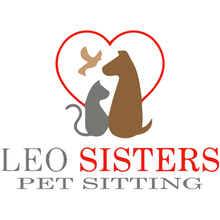 Leo Sisters Pet Sitting was created with the hope of providing pet parents a a professional who delivers a 5 star service. "Megan and Melissa did amazing with our Boston Terrier who had to get knee surgery a couple months back but is now fully recovered. I like most pet owners definitely consider my dogs my children and I felt completely comfortable and confident with our Boston Terrier being in their care. They were great about being in communication with us about whether is was sending us a photo of her everyday during her walks, to texting us to see if she would need to be walked the next week as well as being able to accommodate our wishes of keeping her on her limited activity after her surgery up until now where she is no longer on limited activity. We are so sad they are moving out of state but anyone who is looking pet sitter I highly recommend them." - Alicia M.
"Megan and Melissa took care of our new little Chihuahua starting at 8 weeks old. They were amazing, always reliable, flexible with my schedule and so loving to our dog. They are very trustworthy. We even had them take care of our dog for a weekend while we were out of town. Anyone looking for a pet sitter knows they will be getting a great one!" - Amanda T.
"Megan and Melissa were wonderful with our golden retriever puppy. We needed to have them come walk our dog a couple days each week while my husband and I were working, and we were so appreciative of their reliability and consistency with scheduling. They also sent updates throughout the day during the walks, and were always quick to respond to our communications. We're sad that they're moving as we would have loved to continue using them. Megan and Melissa are a wonderful team and it was such a relief to know that our puppy was in good hands while we were away!" - Caitlin W.